OK, well, this blog is primarily about art... however, it's also about "the meanderings of my mind" as I work on art projects, and often, that involves thinking about the books I'm reading (or listening to - thanks, itunes!). 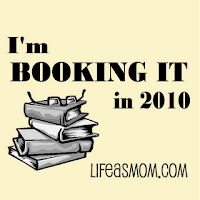 Jessica, over at Life As Mom, is hosting a linky about all the books you hope to read this year...You're supposed to pick 12 books you plan to read during 2010, list them, and link to your list on her blog... so here's my list (although I have more than 12 - I have big plans for this year!). 1. The Bible - I usually read it through once a year, but this year, I'm going to attempt to double up each day and read it twice. So far, I'm on schedule... hopefully I can keep up the discipline. I'm using this chronological reading plan, which I did last year, and really enjoyed it. This is the Bible I read. Thanks, Katy - I'm hoping to make it through it! It's pretty ambitious, I know... we'll see how it goes. Anna K. is on my long list too - I hope to get to it one day too! Glad to know you liked it. I hope things go well at your new job! God bless! I must say that this is quite an ambitious list. Good luck getting through it. I know that I personally couldn't read through that many Charles Dickens novels in a year...I'd have to stretch it out over several! Well,Nancy, I may not make it though this list - it is very ambitious. We'll see how it goes! I certainly appreciate your sentiments on Dickens - he can be rather a windbag at times. :o) But I am a bit obsessed with him right now and can't get enough. My enthusiasm may dwindle a bit after the next few thousand pages or so... we'll see! Thanks so much for stopping by! Looks like a great list. I'm sorry I didn't leave a comment before. How is the list going for you? Thank you, FishMama! It's going pretty well. I've started a new job, which cuts down on my reading time, so now it seems really ambitious, but it's going well. I'm keeping track of my reads on my sidebar, so you can see what I've read so far and what my current reads are... It's been fun to see what other people's reading plans are... thanks for the idea!